Big Brother Canada Suzette plunges into the Game "where I come from we don't respect a rat.. Game or no game a rat is a rat"
Peter is trying to become a actor he was trying out to be “Background Actor” for the new superman that was filmed in Vancouver but he never got the part. Andrew asks what is a background actor like a extra. Peter says Yes but Extra is a derogatory comment. They start chatting about actors that are a$$holes on set. Peter met Tom Cruise and says he was the nicest guy. They chat about christian Bale and how he freaked out on someone on the set. Talk moves to other christian bale movies.. The Machinist, Batman.. etc etc. Talla is worried that Topaz isn’t talking to her, Liza or Jillian she doesn’t know where her head is at. Jillian mentions that Emmett really doesn’t talk game with her, he just kinda listens to her ideas. Jillian says she’s been telling Emmett that the girls are easy to beat so they should start targeting some of the guys. Jillian adds that there is only so much she can do until Emmett win HOH then hopefully she can talk him into putting up the guys. Gary is scared that the showmances are so tight that they might be targeting him next once Aneal is gone. Gary says he can see Alec in the kitchen through the mirror in the bedroom. Gary says he wants to get a makeup expert to learn the style Gary does his makeup then perfect it. 11:13am Bedroom Emmett and Jillian milkmancing Suzette and Gary are also in the room working on Gary’s Brand..
Emmett says he’s worried that Liza is controlling Tom, he’s seen strange behaviour ever since Tom and LIza started spending a lot of time together. Tom says that Anderw is making final 2 plans with Everyone Lilza included. Emmett reminds him that Andrew only likes Liza because she’s flirting with him, he points out that LIza is flirting around with a lot of guys in the house. Tom says he doesn’t feel the same way about Liza as Emmett does about Jillian she can do whatever the F**** she wants. Emmett thinks that Liza is controlling Tom and the Game. This is the lamest bunch of people I have ever seen. They are loud and obnoxious. People should be watching Topaz, she is the one that is gaming. Then there is Talla. Can anyone be the dumb. i dont get it why suzette is after Aneal? i was beginning to like the the way she has found out about the boy’s alliance if only she could shake the house before leaving,that would be good to watch.i hope gary is listening and will act on what suzette is telling him but again gary is so caught up with his brand. Needs to talk to more restaurant waitstaff/unemployed TRAINED actors! What’s with all these delusional wannabe “actors”? Maybe Alec needs to seriously keep options open regarding his end-game. Gary & Aneal are disappointing. Do you think they are emotionally overwhelmed? If Lisa wasn’t engaging Jillian, would Jillian seriously play at all? I love how Tom thinks he is so in control, when he is absolutely being played by Liza. I can’t wait for the drama to start next week. 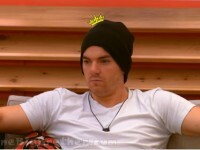 Although I love Emmett, I’m really hoping hoping he doesn’t win next HOH, as everybody is now gunning to backdoor Tom. Can’t wait to see his face when he is put up on the block :-) Let’s just hope this veto twist doesn’t ruin the backdoor plan. I like that jillian has a mind of her own and won’t let tom just push her into what he wants. 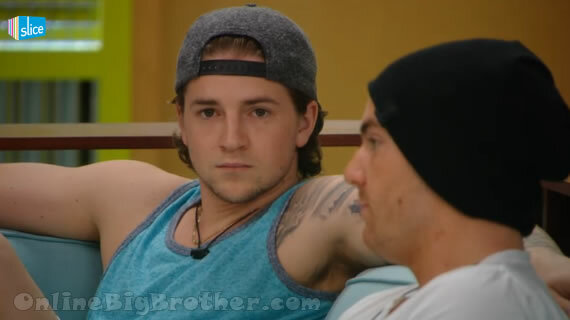 As for hoh if tom goes then as much as the boys want him gone it would weaken them it would be to soon for him to go. It all depends on who wins hoh. I really want Tom gone. Why are Gary and Talla listening to him, willing to do what he wants for his game? Don’t they realize that their only chance in this game is to take out the alpha males? Right now they have the numbers, but they are gunning for each other instead of sticking together to get out the threats! If Gary, Talla, Aneal, Andrew and AJ stick together, they are 5 votes. Gary could probably pull in Topaz, and if the votes are secure, Peter and Alec would be on board too. The only one that is thinking game is Andrew. I am getting tired of AJ, though. I am actually thinking that it is better for the house and the game if Suzette stays and AJ goes. Nobody likes him, even Andrew is getting tired of him. Tom would be livid if Suzette stays, and she might be able to stir the pot and rally the misfits against the guys. This is going to be really boring if something doesn’t change soon. It kind of reminds me of the first few weeks of season 11 when Jessie, PP and Ronnie were running the game. We all know how that ended! I say give Andrew a special power and then the game will open up like it did when Jeff used the wizard power to get rid of Jessie. Emmett is getting worried about Tom. The way their conversation went about Andrew and Liza possibly having a more firm grip on the King than he can realize himself…Keep it up Tom, you’ll be missing your “big king party” in jury house you were planning. I have to admit Andrew can be pretty funny. I laughed hard when Talla came out and he went in and back out after saying he went to look for a gun. Alec could create pretty much his own 4 person alliance if he wanted to. He’s already got Peter and Topaz, he could easily get Topaz to reel in Gary. 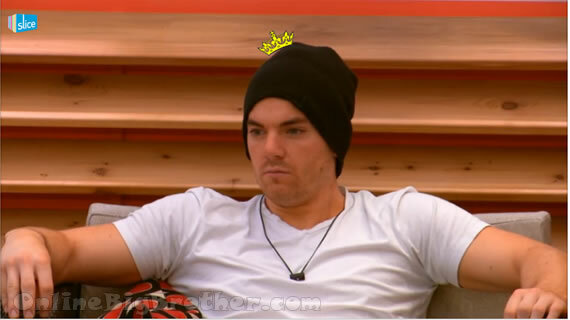 I personally think Alec is in the best position in the house right now. I really think Suzette can save herself this week!!! I don’t know what she is doing! If I were her, I would start campaigning; she can convince the houseguests to blindside Tom by saving her! Hey Ollie, Glad you like the spoilers!